Most people have heard of the Manhattan. It is one of the big, classic cocktails out there. I could go into the history of the drink and extol its virtues, but there are plenty of posts out there already. I will say that the Manhattan is a drink after my own heart. Whiskey will always be my first spirit love. For a very long time I assumed that there was simply The Right Way ™ to make any cocktail, but especially the classics. Now I know that there are often many variations, and while we might be able to track back to the first written recipe, the tastes of time and individuals is too varied to be that set in stone quite often. One of the best things about looking at these old classic recipes is seeing the differences and finding where my palate lies. The Manhattan today is made “Sweet” by default. You only get something other than sweet, Italian vermouth if you ask for either a Dry (French vermouth) or Perfect (50/50 split sweet/dry vermouth) Manhattan by name. It’s interesting to see the variations in these books compared to the modern “standard” recipes. What we call a Perfect Manhattan today, is actually a Dry Manhattan in Savoy, and a Medium Manhattan in Café Royal. Since there are variations on a theme here, I went ahead and made both the sweet and dry versions to compare them. Savoy has several variations, and the Lommebogen recipe kind of falls between the Savoy Manhattan #1 and #2. The syrup is optional in Savoy, if you prefer it really sweet. Café Royal has nothing other than whiskey and vermouth. You can add a dash of Angostura to the sweet. The official IBA recipe is a 5 to 2 ratio (something more like 2 oz. whiskey and .75 oz. vermouth). The traditional ratio that I’m familiar with is 2 to 1 (2 oz. whiskey and 1 oz. 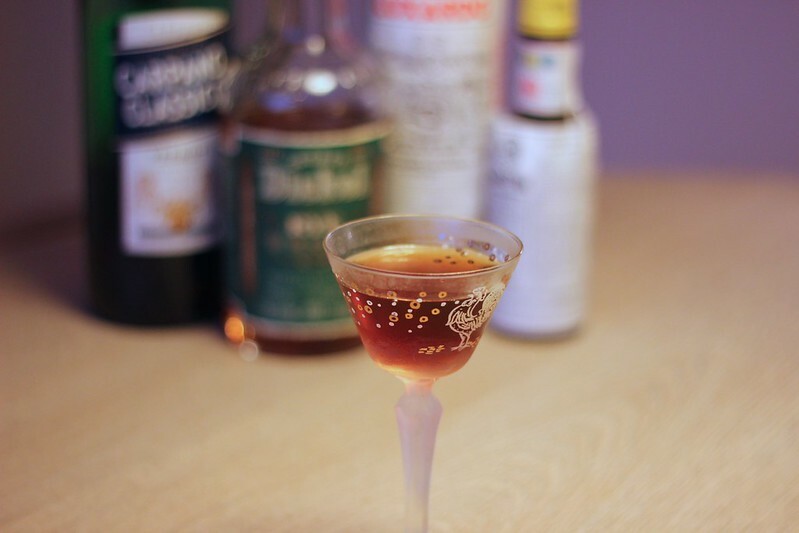 vermouth), which is very often used today, and matches the Savoy Manhattan #2. The half/half variation for a Sweet Manhattan is too sweet for me, and I definitely don’t feel the need to add simple syrup here. Maraschino adds a nice little dimension to it, but also adds a touch to the sweetness. I prefer the common, modern 2/1 ratio here, with Angostura and no additional sweeteners. For the Dry Manhattan, which I have to admit I’ve never tried, I just made it Axel’s way. I should note that I used rye for these, and while I think rye is great for a Sweet Manhattan, I think a bourbon would be better for the dry, simply because it brings its own sweetness to help round it out. I’m not a huge fan of the Dry Manhattan. It just doesn’t seem to marry as well as the sweet, or as a well as gin does in a Dry Martini. Similar to the many sour drinks, Manhattans are all about knowing the ratio you like. It is worth experimenting with the ratio to find your happy place, and then you can specify it when you order. Even a bartender who doesn’t really know what they are doing can make the Manhattan you like if you tell them “2 parts rye to 1 part sweet vermouth, and a dash of Angostura” or what have you.